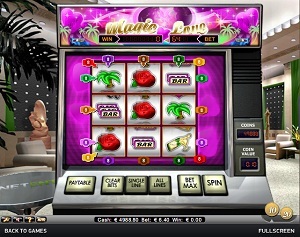 Magic Love is a classic online video slot game from Net Entertainment that has been released in September 2012. This online video slot machine game has 9 reels and 8 pay lines. The theme of Magic Love is inspired by the other slot game from Net Entertainment called Lucky 8 Line (which is based on classic fruit slot games that many online slots players still love spending time with up until now); however, the theme here is more concentrated on the spirit of love leading you to a life of extremely good luck and romance. At first glance, you would assume that Magic Love is an ordinary 3-reel slot game. Thanks to Net Entertainment’s creative fine-tuning, the symbols were made to spin independently, making it a 9-reel, 8-pay line slot machine game. Magic Love is categorized as a fruit slot machine, but instead of fruits, love-related symbols were used such as a heart, rose, ring, car and a champagne bottle. In case you are not familiar with this kind of slot game, you must be careful when you hit the “Bet Max” button as you will be wagering 8 coins per pay line at whatever coin size you are using. Net Entertainment is always very munificent when it comes to their online slots games, and allowing interested players to play instantly without having to download anything is one of the many things why they are very well-liked by all online slots players all over the globe. If you loved playing slot machine game the traditional way, then for sure you will love playing the Magic Love video slot machine game! Take a trip down memory lane with this classic 9-reel, 8-line slot game which has a maximum cash jackpot of $3,200, a maximum coin jackpot of 16000, and last but not least, unique and awesome payouts! Many slots players love to play online slots from Net Entertainment because they provide top-notch graphics and delightful sounds, which make online slots more entertaining and fun to play with. Magic Love is, just as its name suggests, an online slot game wherein love can magically lead to a wonderful life and it’s also your ticket to grab that Jackpot win! The graphics are simple and the symbols used complement the theme of the slot game – hearts, roses, rings, champagne and cars. When you play the game, your slot machine is somewhat inside a casino/hotel room with plants, lush carpet and furniture. Since it is basically a no-frills kind of slot game, Magic Love has been designed to be like a genuine casino ambience with matching sound effects, which makes you more convinced that you are in a casino playing an old-school slots game. The casing of the reels includes the paytable, reels and buttons and coin display. The slot machine they have used may remind you of an old arcade game. The overall graphic design of Magic Love displays colors such as green, blue, red, purple, brown, orange, yellow and pink. There is actually no constant background music you will hear when you are playing Magic Love. However, when you spin the reels, you will hear background music that resembles the ones in classic arcade games. A brief, arcade game-like celebratory music is heard when you get a winning combination. There are no card deck symbols available in the Magic Love online video slot game. The regular symbols you will find in Magic Love are the 3-Bar, 2-Bar, 1-Bar, Heart, Palm Tree, Rose, Ring, and the Champagne Bottle. The Scatter Symbol is the Car. When you get 2 up to 9 Car symbols on a single spin, you are paid according to the game’s paytable. The Car scatter symbol can be scattered anywhere on the reels to complete winning combinations. Scatter wins are added to the pay line wins. If in case you do not have any pay line wins, then you are paid for the scatter wins. Magic Love does not have a Bonus Feature game. Magic Love has 9 reels where you may bet on 8 pay lines. The minimum bet is 0.10 and the maximum bet is 0.20 per line. Playing online video slots is much more enjoyable and easier when it has an Autoplay function. You can play Magic Love automatically by clicking on the Autoplay button located on the lower left side of the game screen. You can set the number of spins by clicking on any numbered button, from 10 to 1000, and after choosing the number you want, click Start and the game will automatically spin for you.